GROWING UP IN McCarty’s Village, on Acoma Pueblo, Stephanie Oyenque enjoyed an adventuresome childhood. She and her two older brothers hunted crawdads in the creek, slid down the clay mesa, built forts, and rode bikes. Her world is more academic now. At 36, Oyenque holds a master’s degree from UNM in language, literacy, and sociocultural studies, with an emphasis in American Indian education. 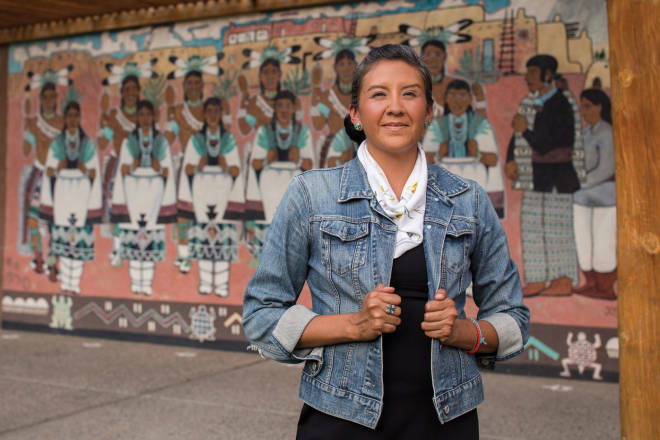 She’s now the cultural education specialist at the Indian Pueblo Cultural Center, in Albuquerque, where she recognizes the past while providing opportunities for young Native people to take control of their story. November 16–18, Oyenque, who is also the mother of a 6-year-old daughter, will host the fifth annual Pueblo Film Fest, with a theme of Empowering Women Through Film. That’s what IPCC does: tell those stories from not so long ago. Like my grandmother. She was born in 1905. She went through the Great Depression, went through all this hardship and struggle—she was a widow and she raised like a dozen kids just by selling her pottery. When you think about those stories, it just makes you want to work harder. It’s just about providing people with a basic understanding that Native people are still here. While we adhere to traditional techniques, we are very fast-forward and very futuristic. My mother is a little bit older, so my fear is that she’s going to pass on. Once she does, she takes everything with her. I lie awake at night thinking about how I have to learn everything that I need to before she passes on, because once that’s gone, that’s it. There’s no more, and who’s going to teach me? I always tell my daughter, “You don’t ever need a partner. That’s going to come in time. Love yourself, take care of yourself, learn about who you are first. All that will come, believe me.” And I think that’s what I want to tell every young person, every young woman, is not to get caught up in a relationship. Figure out who you are first. She always tells me, “Mom, I can’t wait for you to be a grandmother!” and I’m like “Really?” I can, but I’m like, I want to be a grandmother. Make me a grandmother, please! I am a seamstress, so I make her dance clothes. I make my own everyday wearable clothes, too. I’m self-taught. I basically turn garments inside out and look at how people constructed them. Repurpose and recycle. It’s about Native filmmakers and Native producers, directors, exercising their own agency to say, “Look, I’m in control of my own story. I’m in control of my own voice. It’s not up to you to tell my story.” And I think that’s what the film fest does: It creates that space for these young people who are probably tired of seeing a non-Native filmmaker tell their own story. That’s what we want for our people. Showcase your talent. Where is it going to take you? I hope to higher places. It’s telling these young women that you do have a family that loves you. You do have a community that supports you. I think you have this spectrum of people who have zero knowledge of Native history, that we even exist. And you’re just baffled, like “Wow, you didn’t know Native people existed?” Yeah, we’re here, we’re in the flesh, we’re alive, we have traditions, we have customs, we have our language. I think with my daughter it’s a matter of telling her not necessarily the actual truth [about the near annihilation of Acoma at the hands of Juan de Oñate] just yet, but it’s more about the positivity side of it. Don’t ever let somebody tell you you’re not worth it, that you should be ashamed of who you are. I think now it’s about creating this tiny little human being of positivity and the amount of strength and resilience that she carries with her as a little girl. I want her to be the next Ronda Rousey, you know? That she is a badass little girl. While still holding on to her language and traditions and dancing for Feast Day and being a little farmer. Read more: Española&apos;s El Paragua restaurant is legendary. So is the tree growing inside. I learned at a very young age how to shoot a rifle. It taught me a lot about respecting the weapon I have, that it carries so much power, that it can end a life, and it’s about you as a person knowing that and making sure that you’re taking care of that power that you have. Last year, I took down my first elk, and my brother looked at me because he thought I was going to be emotional and just start crying and be like “I don’t know what to do.” But I jacked another shell in and I was ready just in case that elk got up, and it went down on the first shot. Talk about empowerment. That’s heavy, right there. That killing is not a sport, but this meat is going to feed my family for the next couple years. That I got to spend a day with my brother that I probably won’t get back, that is etched into my brain forever. That all the teachings and advice that my dad and brother have taught me. Could I do this by myself if the time came? You bet I could. It’s not about looking to the man for support, and that’s what I want to teach my daughter. That she can do it herself. She doesn’t need anybody to change a lightbulb, she doesn’t need anybody to change a tire, that that little girl can do it by herself. And I’m going to teach her. As her mother. That’s pretty darn cool. The Indian Pueblo Cultural Center hosts the fifth annual Pueblo Film Fest, November 16–18.